Shamanic healing is at least forty thousand years old and was once practiced by our ancestors on all inhabited continents. It includes many different spiritual practices to heal the spiritual aspect of problems and illness. The main causes of illness, as a shaman sees it, are the loss of soul essence, the loss of personal power and the presence of misplaced energy or spiritual blockages. Shamanic healing seeks to recover a person’s lost power, to restore their vital soul, and remove harmful energies. Sometimes shamanic divination is also needed to solve problems and bring healing in the form of much-needed answers to life problems. All Sessions Are Private And By Appointment. 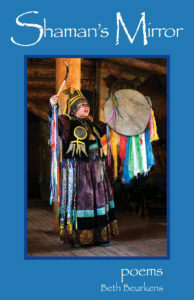 Disclaimer: Beth Beurkens, Shamanic Practitioner, is not a licensed physician or surgeon and Shamanic Healing treatments are not licensed by the state of Oregon or California but are complementary to healing arts services licensed by the state. Shamanic healing is an ancient spiritual method of healing that deals with the spiritual aspect of illness. As shamanic healing deals with the spiritual aspect of illness there is no way to predict the results that will manifest emotionally or physically. Shamanic healing does not replace the need for traditional psychological and medical treatment or advice and is not intended to diagnose, treat, cure or prevent any disease. Payment may be made by check or money order.